It’s over now. The Patriots completely decimated the Broncos last night, 45 to 10, and it wasn’t that close. They eased off the throttle in the third quarter and coasted in. They toyed with the Broncs: at one point Brady quick kicked on third down, a surprise tactic usually used by teams unable to get a real punt off due to defensive pressure on fourth down. In this case, New England was mocking the Broncos, giving them the ball back before they had to. Just for fun. It was as thorough a beatdown as we have seen. And Timmy was completely overmatched. So what did the Tebowistas learn? Nothing, probably. The Tebowistas did not see the same game the rest of of saw. Last night, one analyst on ESPN was talking about all the dropped passes by Bronco recievers. As a general rule, QBs don’t worry about dropped passes, because for every one that is waist high and perfect that the reciever doesn’t catch, there is another at shoe lace level that a receiver does catch. At any rate, if Tebow’s receivers had caught all those bad balls, it wouldn’t have mattered much. His QB rating might have reached the twenties, where it lived all season, rather than the wretched 9.5 he achieved. Exactly 1/10th of Brady’s rating, 95.1. What did the rest of us learn? 1. Tebow is not, and will likely never be a top-tier NFL quarterback. He is too inaccurate, his throws too wobbly, and his motion too elongated. He will continue to miss receivers and to fumble, as rushers strip him from the back side over and over and over. 2. Tebow is better than most of us ever thought he would be. He’s strong, has excellent judgment, and can read defenses, particularly when his scrambling causes coverages to break down. He is a lot of fun to watch. 3. Maybe Kyle Orton wasn’t so bad either. Yesterday was not all Tim’s fault. The O line was absolutely woeful. Orton looked very bad behind that line, and Tebow looked worse. Once the Patriots established a lead and the Broncos needed to pass to catch up, the team’s line deficiency was completely exposed. Nor was the defense as good as advertised. For the second time in a month, a defense that looked good against the mediocre teams on the Broncs’ schedule proved to be about as effective as rice paper against a competent offense. The Patriots scored 45 and could have scored 65 had they wanted. Even us T-bow haters can’t reasonably expect a first year QB to overcome that. 4. The Tebow offense is probably not destined for a lot of success in the NFL. Every decade or so, someone tries some version of this, has some initial success, and we all get excited. Then the defenses watch a little film and it’s over. It may be over now for the Denver Broncos. 5. John Elway is seriously screwed–his team has frittered away a good draft position and is stuck with the worst QB in the league. Now what, boys? Of course, it may not matter because they may still be able to fill the stands and sell a trillion jerseys to the true believers, but Elway came back to lead his team to the promised land. Instead it looks like it’s forty years in the wilderness. 6. John Fox deserves what he gets. He pandered to the masses putting in this offense and running Orton out of town. “…whatsoever a man soweth, that shall he also reap.” (Galatians 6:7) Oh well, at least Tim’s not completing passes to the other guys like his last QB, Jake the Shake Delhomme. 7. 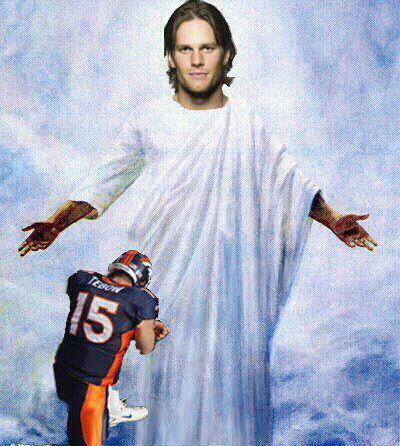 Even Jesus loves Tom Brady more than Tim Tebow. Well, duh. On #2, I’d say sure, for a college QB. He can read the DE on the option play, but as I have said before, he reads secondaries and pass coverage like Snooki reads Proust: infrequently, and without great understanding. He doesn’t audible much because he has no idea what he’s looking at and most of his successful passes happen when the perfect play is called and he has one-on-one coverage exactly where the offensive coordinator expected it to be. not sure you’re right though. the kid doesnt throw picks. most bad qb’s do, e.g., caleb hanie. he may not be that good on the pre-snap read, but he seems to see the field well as the play develops. Why doesn’t he Tebow when he loses? I mean, shouldn’t he apologize to God or something when he wobbles a shite pass? Shouldn’t he ask for more celestial guidance in the future when things go wrong? I can’t get the image of Snooki ruminating on a madeleine out of my head! Let’s appreciate Timmie for what he is: an inspiring role model, a shot in the arm for professional sports,but probably in future seasons, a remembrance of things past. I don’t find much inspiring about him and when I look for role models I tend to automatically eliminate anyone who pimps for Focus on the Family. Jesus Christ, it is RECEIVER. I before E except after C. Don’t you run spell check? Sorry. The copy desk is busy on Sundays. Good to see readers being passionate about something. I probably should run spell check. Especially for that. For some reason, I have never been able to get that right. When an English publisher decided to publish one of my novels, they came back and asked me if I knew I’d spelled the hero’s name Kiernan 49% of the time and Keirnan 51% of the time. For some reason, that combination is simply beyond me. Sorry if it bugs folks, as apparently it does. I’ve never gotten in the habit of spell check because I am actually a pretty good speller. Except for that. Well maybe if you weren’t so critical of Tebow, then Jesus Christ would like you more and help get the whole i before e rule straight. Then again, since Jesus obviously doesn’t care about football enough to make Timmy a competent quarterback, he’s probably not all that concerned about spelling rules for a language he never learned to speak. That image is the funniest thing I have seen in a very long time. Thanks for the chuckle. I’ve just never understood the amount of attention we seem to devote to Tebow here. There are plenty of other players in the NFL, and indeed, plenty of other mediocre QBs–all of whom have raging egos. We’ve not spent any time griping or gossiping about them. Kim Jong Il, one of the most notorious despots of the last umpteen decades (and someone with a messiah complex if ever there was one), died last month and he didn’t get a blip here, yet we can seem to waste plenty of energy bitching about Tebow and tearing him down. And then we’ll spend time bitching about how shallow society is. Love it. First, Tebow is very, very easy. Easy to make fun of, easy to write about in 30 minutes (which is what I spent on that last post,) easy to establish a connection. N. Korea is hard. I have a list of six blogs I am working on (our increasingly militaristic society, deadbeat farmers, etc,) but most of them require research and thought. Preparing them is like cooking a souffle. Writing about Tim is like opening a bag of chips and a jar of salsa. Second, people are interested. We should be embarrassed for being so interested, but just like Paris Hilton and Snooki (who reads Proust,) he is one of those inherently uninteresting people that we choose to make interesting by using them as emblems of broader things that are wrong with our society. Tim is not very interesting as an athlete or a person, but he is very interesting as an example of how evangelical zealots will promote one of their own shamelessly and unfairly, and will distort reality to justify it. Nonetheless, I am shamed. I will write something serious next time. At the risk of over-essentializing, I think some of us see rampaging dominionism as a bigger problem for our society than others do. Kim Jong Il only came to power in 1994. Granted the years between then and now were rather brutal in a let your people starve and imprison the one’s who question you sort of way, but other than a foil for American foreign policy, he meant very little … he was my favorite crazy-evil-monkey-boy, but that’s a post that never got written. If you spent all those years in Korea, you’d have never known that we were perpetually on the brink of war. In fact, i spent almost two years in a location certain to be leveled immediately and mostly didn’t know that it was about to happen at least a dozen times until i got emails from the United States. And then, much to my disappointment, it never did happen. So really, Kim was just another person to discuss and grind a few axes over like Tebow is … aside from the whole starving people, but we mostly don’t talk about all the other people who do that so i’m not sure it’s such a great distinction. Sorry, I missed all the discussion of religion and dominionism and all that. I just saw discussion of quarterback ratings and Kyle Orton comparisons and predictions of John Elway’s prospects. Mind you, I thought it was a fine post. I read it. I showed it to a friend (the picture was hilarious). I read everything you write. And I forget, too, that many of the blog’s writers are centered around Denver, so naturally things going on there are going to catch their attention, especially when those things are of national interest. I just have a bad case of Tebow fatigue. I don’t care about his religion; I care that I can’t seem to turn around without tripping over the guy. My apologies. Lex, I’m glad you didn’t get blown up.